LONDON (AP) — More than four decades after they first hit the road, The Who gave an impromptu performance Thursday to show they're in fighting form for a 28-city European tour. The band's two surviving original members, Pete Townshend, 61, and Roger Daltrey, 62, played a four-song acoustic set at a news conference in London. Their 14-country arena tour begins May 8 in Lisbon, Portugal, and ends July 9 in Helsinki, Finland. They said they planned to continue touring around the world after Europe. "We're playing because Roger wanted to prove to all you cynical press people he could still do this," Townshend joked, sitting on a stool, his guitar balanced on his left knee. Townshend strummed furiously as the pair launched into their hit "Won't Get Fooled Again." Daltrey stood beside him, eyes closed, as he leaned toward his microphone, singing with intensity. The performance was broadcast live on the Internet from a music studio in Covent Garden. Afterward, they answered questions from fans in the U.S., Sweden and Australia, as well as from journalists. The pair were asked about their turbulent relationship, which led to the band's breakup in 1982. "Our relationship is back in the middle, it isn't up or down, it's there in the middle," Daltrey joked. "We're working on making it go down." Townshend disagreed: "No, I think it's up." 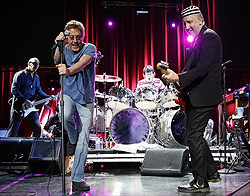 The tour follows last year's release of "Endless Wire," The Who's first new album in more than two decades. Townshend credited CBS-TV series "CSI: Crime Scene Investigation," which uses "Who Are You" as its theme, and the series' two spinoffs, which also use their songs, for keeping their music in the public eye during "the quieter days of the band." COPENHAGEN, Denmark (CelebrityAccess MediaWire) — Legendary classic rockers The Who will be joining previously announced headliners Red Hot Chili Peppers and Björk at this year’s Roskilde Festival. Coming off their first studio album release in 30 years with “Endless Wire,” Roger Daltrey and Pete Townshend are now ready for more than giving a history lesson with their raucous live shows, proving that the old dinosaurs still have what it takes to really rock. Other artist announcements are expected in the coming weeks.